A type of cream with a rich, buttery texture that is used as a topping for desserts. Originating in Devon, England, the cream is produced with unpasteurized milk that is heated to separate and thicken the cream as it rises to the surface. 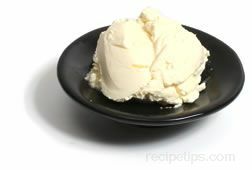 Also known as clotted cream, Devonshire cream is commonly used as a topping with jam to be spread on sweetbreads, biscuits, and scones.